A versatile banner that has been designed with simplicity of use in mind. Manufactured in the UK, allowing us to offer it in a choice of widths. The larger sizes offer a very cost-effective solution for wide-format graphic displays. Hard-wearing end-plates. Adjustable feet – ideal for leveling on uneven surfaces. Quick-change external slide-in leader system for base graphic attachment fabricated from a unique robust ‘Co-Ex’ extrusion PVC component. High-specification carry bag with extra padding for durability and protection. Available in the following widths: 600mm, 800mm, 1000mm, 1200mm, 1500mm, 2000mm, 2400mm. A versatile banner that has been designed with simplicity of use in mind. 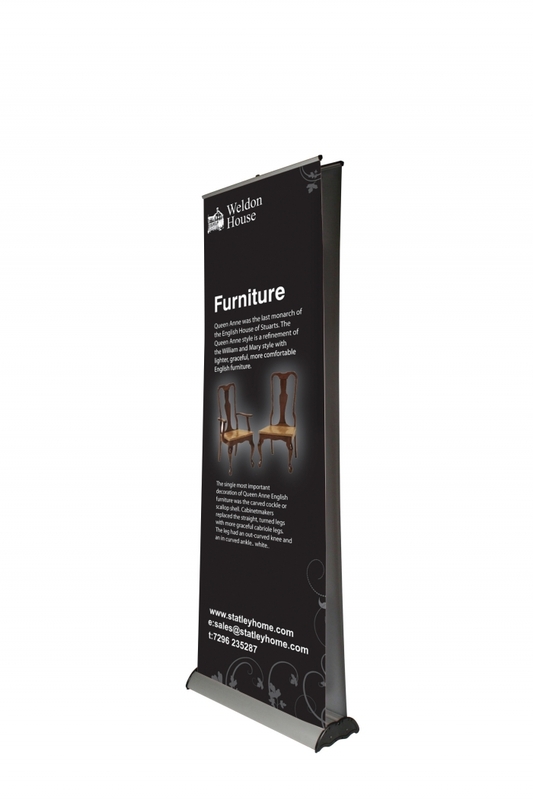 Manufactured in the UK, allowing us to offer it in a choice of six widths. The larger sizes offer a very cost-effective solution for wide-format graphic displays. Hard-wearing end-plates. Adjustable feet – ideal for leveling on uneven surfaces. Quick-change external slide-in leader system for base graphic attachment fabricated from a unique robust ‘Co-Ex’ extrusion PVC component. High-specification carry bag with extra padding for durability and protection. Available in the following widths: 600mm, 800mm, 1000mm, 1200mm, 1500mm, 2000mm, 2400mm.